Hello and welcome to the MFT February Release Countdown Day 4! All of the amazing new products will be available on Tuesday, February 5 at 10 AM EST. Make sure to stop by the MFT Blog during the countdown to see the full reveal. 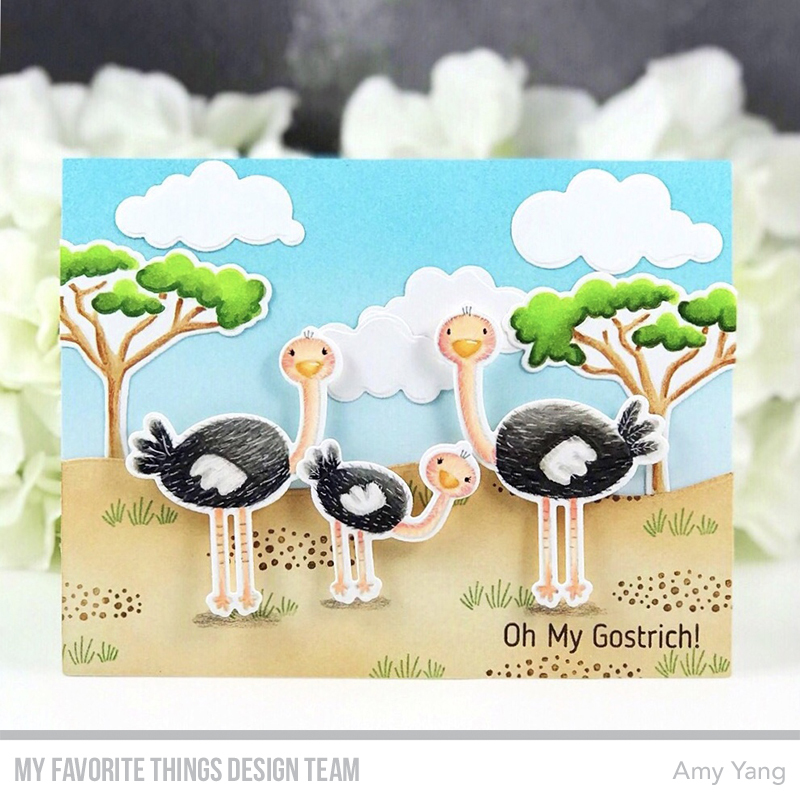 For my project today I created a scene card that features the adorable Oh My Gostrich set. To begin, I stamped the ostriches from the Oh My Gostrich and the trees from Aussie Animals stamp sets with Cement Gray Hybrid in for no-line coloring with Copics. I added details on the ostriches with colored pencils and a white gel pen. After, I die-cut the images with their coordinating dies. The A2 sized front panel was ink blended with Distress Oxides. The hill panel was die-cut with a die from the Snow Drifts Die-namics and ink blended with Distress Oxides. On the panel, I stamped the cluster of rocks and the sentiment from the Oh My Gostrich with Milk Chocolate Premium Dye Ink and the patches of grass from the Aussie Animals with Gumdrop Green Premium Dye Ink. The clouds were die-cut with Puffy Clouds Die-namics. To finish, I adhered everything together as shown to create the scene. Awesome new stamps and dies! Awesome creation! I love Gostrich ostriches! I love the new stamp/die sets with all the animals...such cute kid cards. These are so fun! Amazing job coloring the ostriches too! Love your card. Pretty, bright colors. So cute - love the coloring! Loving these ostriches! Super cute! Love this card. Those ostriches are absolutely adorable! Cute card Amy. Scene cards are so fun and yours looks like you had lots of fun making this. Lots of love and work went into this. Thanks for sharing with us. 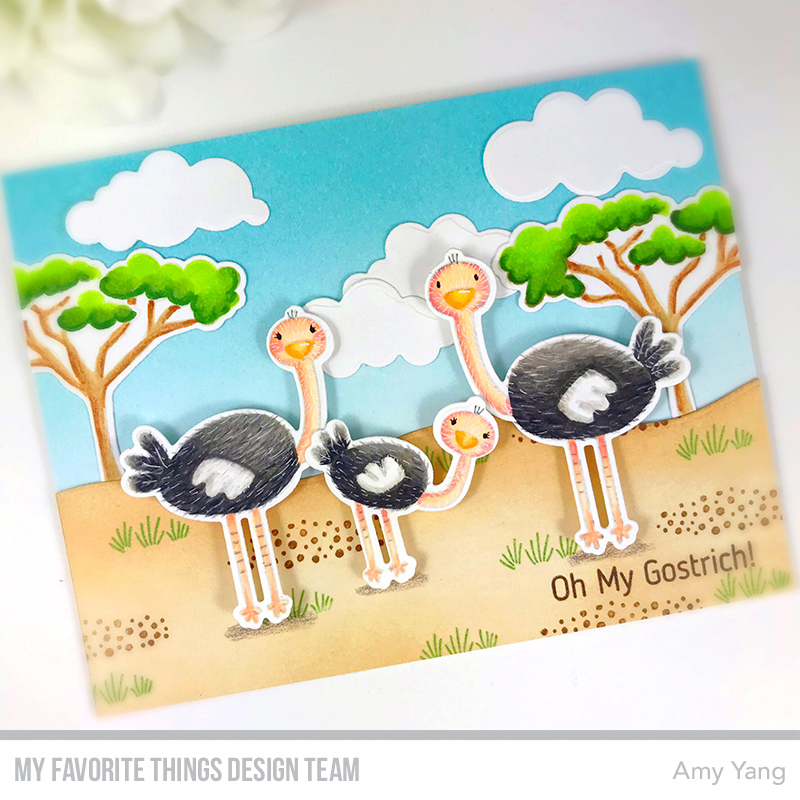 Those ostriches are so adorable, made for such a cute card! Beautiful coloring especially the feathering! 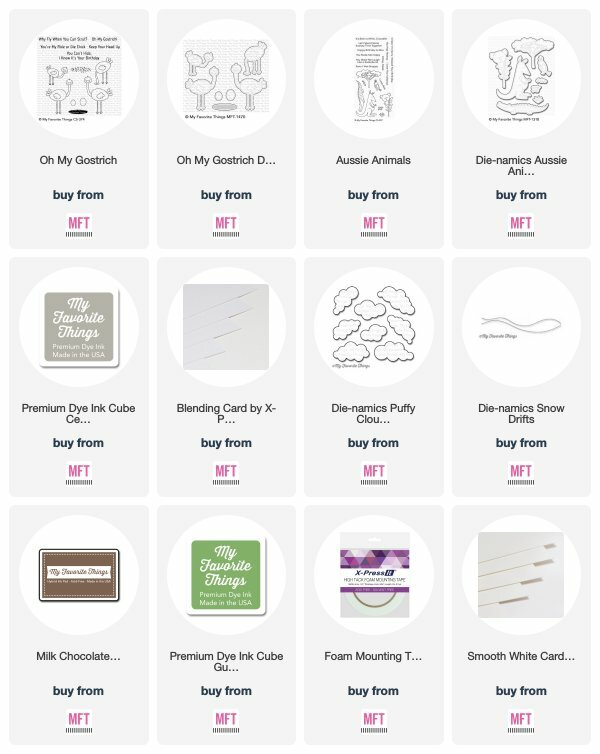 Love your adorable card--such wonderfully colored! 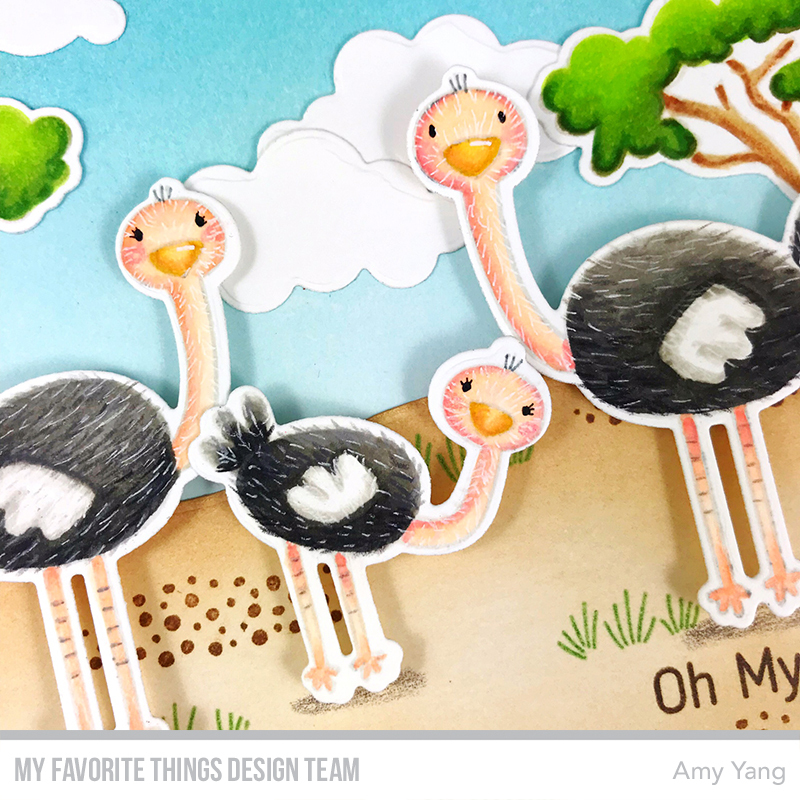 I just love these ostriche stamps snd die cuts. You did an awesome job coloring them and make their feathers come to life. I love the way you put the scene together. This inspires me to pull from different sets to make my card. Great job! These little ostriches are too cute. You pulled everything together so cute.